Although this is slightly outside of my time frame for vintage horror movie reviews, I just had to include it here because, for some odd reason, I had never seen it and absolutely loved it. 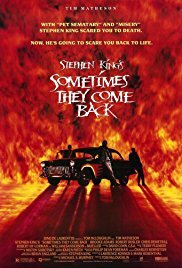 Sometimes They Come Back is an adaptation of a Stephen King story. How I missed this film is a mystery to me. As far as I'm concerned everything about it works well. The story revolves around a teacher who comes back to the town his family ran away from due to the death of his brother when they were kids. His return unleashes something, or several somethings, he needs to confront if he is going to have any peace in his life. It's classic King territory and the story is told very well. Director Tom McLoughlin (Jason Lives: Friday the 13th Part VI) pulls off something that rarely happens: This made-for-tv movie feels like a big budget movie release. It has great filming locations, set designs and tons of suspense. I also admired the special effects work which, until I looked it up, suspected it belonged to someone like Rick Baker. Instead, it was done by the team of Gabriel Bartalos (Darkman, Godzilla remake), Patti Brand, and Daniel Marc (A Nightmare on Elm Street 2, House II). Kudos for just the right gory touches to add to the mood of the film. The cast was pretty much near perfect. Tim Matheson (Animal House, The West Wing) plays the adult version of the boy whose family fled the town many years ago. He's great in this role and so is Brooke Adams (Invasion of the Body Snatchers remake, The Dead Zone) who plays his wife. They make it easy to care for the family at the center of this supernatural drama. And what's a good horror film without its bad guys? Robert Rusler (A Nightmare on Elm Street, Weird Science) and Nicholas Sadler (Twister, Idle Hands) are lots of fun as two street punks who simply won't stay dead. They play off of Matheson perfectly. I also need to mention Chris Demetral (The Secret Adventures of Jules Vern) who is the older brother who was killed early in the movie. His presence is seen and felt throughout the film and it wouldn't be the same without him. So, if for some reason you've never seen this one then do so ASAP. You can find it streaming on YouTube. It's great for fans of supernatural horror as well as Stephen King. Don't miss it!